VANCOUVER, BRITISH COLUMBIA--(Marketwire - Feb. 1, 2012) - Magellan Minerals Ltd. (TSX VENTURE:MNM)(OTCQX:MAGNF) ("Magellan") is pleased to announce the results of seven additional exploration holes recently drilled at the Central North zone at the Cuiu Cuiu project. Central North is located 300m - 600m north of the Central zone (comprising 3.4Mt @ 1.0 g/t of gold in the indicated category and 17Mt @ 0.9 g/t of gold in the inferred category) at Cuiu Cuiu. The seven holes reported here are all from follow-up holes designed to test the extent of the mineralization encountered in hole 131 which intersected 39.4m @ 1.25 g/t gold and is located 360m from the northern margin of the Central zone. All of the holes are exploration / step-out holes and are drilled outside of the known resource and between 300 and 600m north of the Central zone (see map on website). 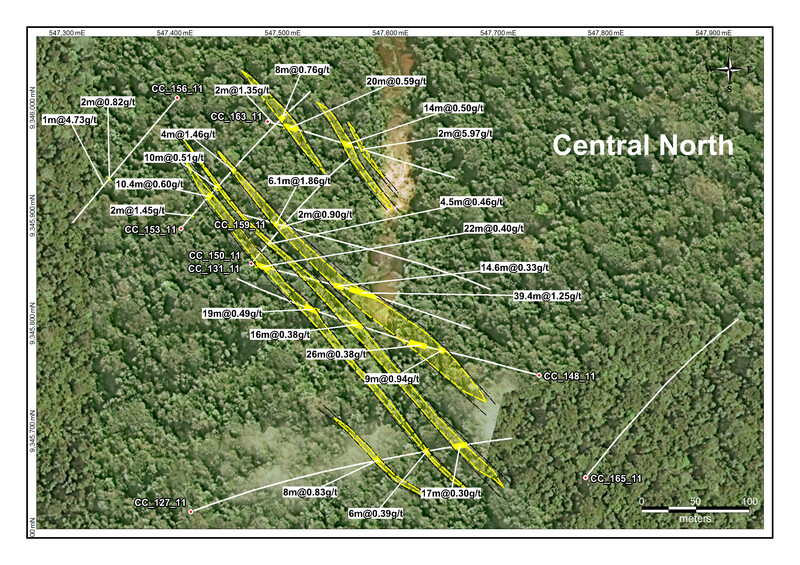 Six of the seven holes reported here intersected gold mineralization in multiple intervals confirming the presence of another mineralized zone at Cuiu Cuiu and immediately north of the Central body. The gold mineralization reported here from Central North is all well above the 0.30 g/t grade cut-off used for the Cuiu Cuiu resource estimate (see press release dated March 8, 2011) The Central North zone has been traced for at least 350m and appears to trend NW-SE and is offset from the main Central body (see map on website). The zone remains open to the north-west and south east. Further drilling is planned during 2012 to more accurately define the extent of gold mineralization of Central North. Alan Carter, President & CEO of Magellan, commented, "These recent drill results confirm the presence of a new mineralized zone at Cuiu Cuiu 300 - 600m north of the existing Central zone. This zone together with the recently identified Jerimum Baixo zone located 3km SE of Central is outside the existing resource estimate and confirms the presence of multiple mineralized bodies at Cuiu Cuiu." 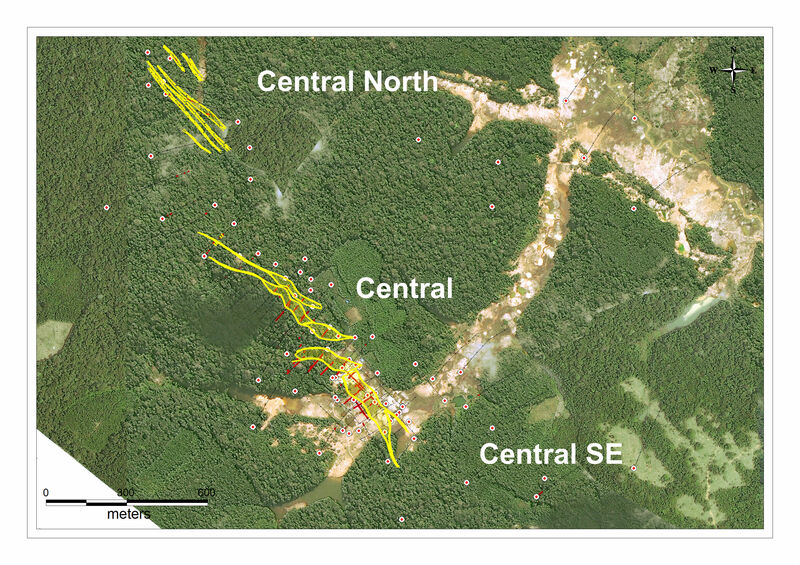 Magellan is currently conducting a program of ground IP geophysics over the Moreira Gomes and Central deposits at Cuiu Cuiu which collectively comprise current published resources of 1.2Moz (31Mt @ 1.2 g/t) of gold in the inferred category and 0.1Moz (3.4Mt @ 1.0g/t) of gold in the indicated category. The published block model inventory for the Central and Moreira Gomes deposits at a 0.30 g/t gold cut-off comprises 3.5Mt @ 1.0 g/t gold for 110,000oz of contained gold and 45Mt @ 1.0 g/t gold for 1.4Moz of contained gold. Holes were drilled at 50 degrees from horizontal. All core samples (HQ diameter) were cut with a diamond saw and one-half of the core placed in bags, numbered and sealed then sent via a secure transport agency to the Company's office in Itaituba before shipping via secure transport to ACME preparation laboratory in Itaituba for sample preparation. Core samples were crushed down to 2 mm and a 1 kg split was pulverized to better than 85% minus 200 mesh. From Itaituba, ACME sent the pulp samples to Santiago, Chile for assaying. Gold analyses were conducted on 30g representative sample cuts using fire assay with an atomic absorption finish. Other sample cuts were subjected to a 4 acid digestion and analysed for silver and an additional 35 elements using inductively coupled plasma mass spectrometry (ICP-MS). ACME is an ISO 9001 registered laboratory and has a quality control program in place which includes the insertion of standard, blank, and duplicate samples, as well as conducting repeat analyses. Magellan's QA/QC program also includes the insertion of standards, field duplicates and blank material in the sample sequence with the normal core samples to monitor sampling variances, laboratory precision and accuracy. This press release was reviewed by Dennis Moore, B.Sc., M.Eng., a member of AIG, AUSIMM, and the SEG, a qualified person in compliance with National Instrument 43-101. Magellan Minerals Ltd. (TSX VENTURE:MNM) is a TSX Venture Exchange listed exploration company with a number of gold exploration properties in the Tapajos region of northern Brazil and is focused on the Cuiu Cuiu and Coringa projects.